When you're a participant in a conversation in Front, you have two options: to subscribe to the conversation, or to mute it. You can think of this like "following" or "unfollowing" a thread on social media. 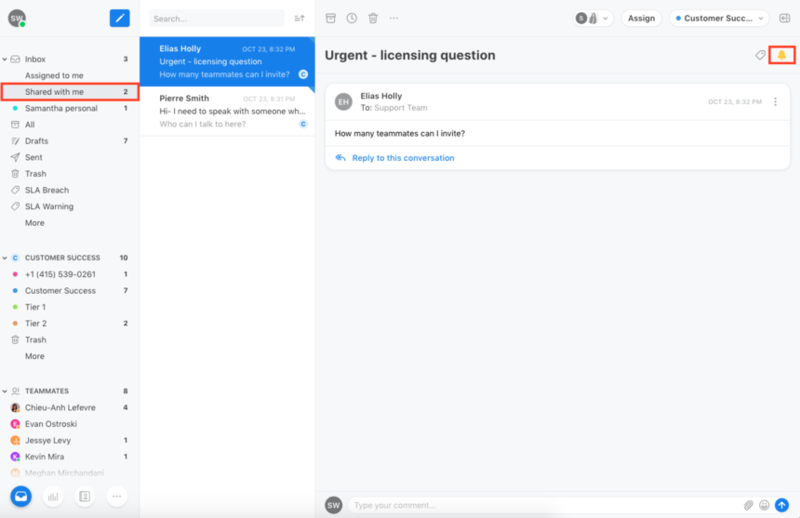 If you're subscribed, you will see all new replies and comments in the conversation in your inbox. If you've muted, the conversation will archive and only pop up again in your inbox if you are @mentioned specifically. Where are my subscribed conversations? 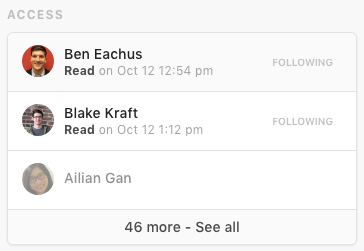 All conversations you're subscribed to will show up in your Shared with me section in your Individual Inbox. The conversation will automatically bump to the top if there is new activity within the subscribed conversation. When new comments are sent or messages come in on a conversation you're subscribed, your Shared with me will bold. As a subscriber to a conversation, you automatically become a participant in the conversation. This means if there is more than one person that is partaking in the conversation, your avatars will appear in the participant menu. Others will be able to tell when you have last read the message or if you have muted the conversation. If you want to stop getting updates on the conversation, you can mute the conversation. Muting the conversation will allow you to search for it in the future, but the conversation will not automatically bump in your Shared with me unless you have been directly @mentioned. To mute a conversation, click the bell icon above the message and select Mute and Archive. Whenever you manually mute a conversation, it will also archive. What happens when you mute? Being @mentioned will unarchive the conversation for you, but not subscribe you. If you would like to automatically have the conversation bumped in your Shared with me after you have commented, toggle the setting on. If you would like to automatically have the conversation bumped in your Shared with me after you have replied to a conversation, toggle the setting on. 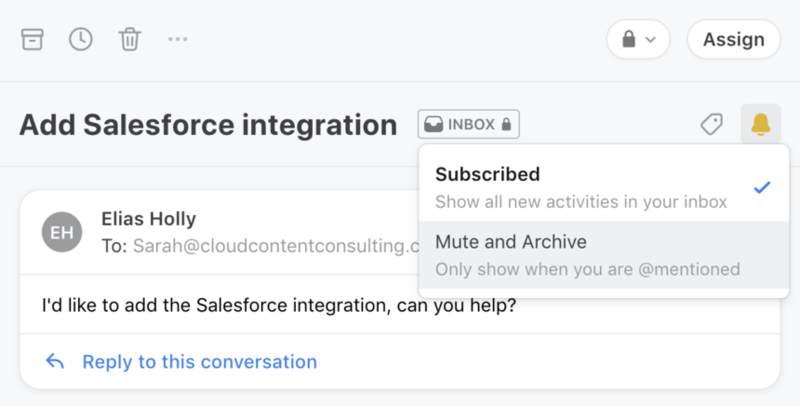 If you would like to automatically have the conversation muted and archive when you move a conversation from your individual inbox to a team inbox, toggle the setting on. 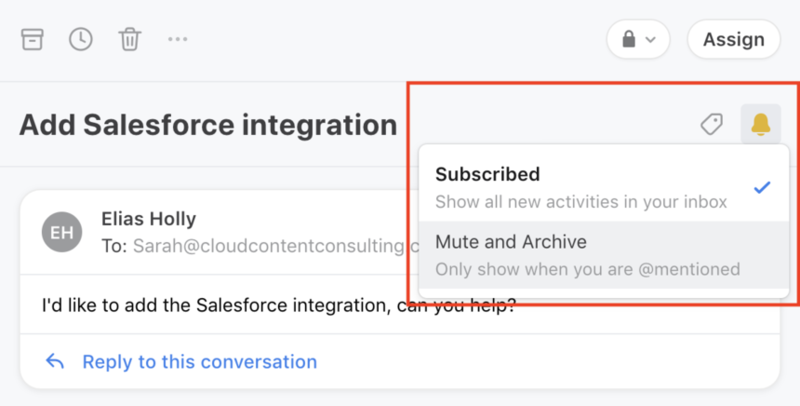 If you would like to automatically have the conversation muted and archive when you unassign a conversation from yourself, toggle the setting on. This will not archive the conversation in the team inbox. how can you see who is following an email? Click the "i" in the top right corner and you'll be able to see who is following a conversation. See screen shot below. If I archive a message in Following, will it archive for the person it's assigned to? What about if I mark it as read by viewing it? Galen King Yes, it will archive for the person it's assigned to. It's best to unfollow the conversation if you don't want it in your Following folder. If you mark it as read, it will only be read for you, not for the person it's assigned to. Cori Morris OK. But I want an inbox zero. Let's say I receive a message in my personal inbox. I want to make it followed by a member of my team. I can do this. But I want to get rid of it in my inbox. If I archive it, it will archive it for my team member. Will he be able to access it though? Will he see it in its 'following' folder anyway? If not, should I leave it in my inbox folder forever? Jerome Chouraqui Yes, your teammate will still have access to it even if it's archived, but it will be in the ALL tab of his following inbox. If you want him to reply to the email, you should assign it to him, instead of adding him as a follower. Is this article still accurate? I just tried archiving a convo in my "following" folder, and it is not archiving for my coworkers. To be completely transparent, you're on a newer version of Front where this article is not accurate. We are working on transitioning all Front customers to the version you are on, so some articles will be inaccurate for you. The "following" folder is now "your own" so you may do what you wish with it. Hope that clarifies why you're seeing this! Cori Morris Is there a way to adjust settings so that I don't follow conversations automatically? Paul Go You can always make sure to have the option "assign on first reply" turned of in the channel as well as the option "Auto-follow when commenting" turned off in your settings. This will reduce the amount of conversations you are following. However there is no specific way at the moment to turn following off completely.